Learn how to maximize the gift of this life-changing teaching. “Know thyself” via a guided series of video lectures and archetypal chart exercises not available anywhere else. Working with these advanced Sacred Contracts methods will offer insights that will enable you to move out of your past and into your highest potential. Sacred Contracts are “soul documents,” life assignments that are encoded within your psyche and soul in the symbolic language of archetypes. Identifying your archetypal patterns helps you to understand the source and nature of your feelings and passions. You will learn that the course of your life – your destiny – is not in the hands of others, or dependent on whether they approve of your choices, or you approve of theirs. 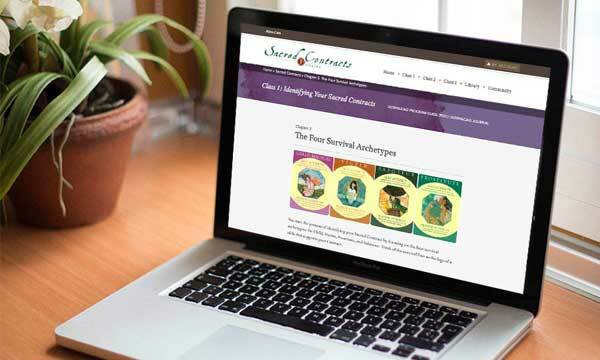 The SCO is designed as a stand-alone course that will enable you to learn your Sacred Contract and work with archetypes in your daily life. Lifetime access to the online course, and over 60 hours of audio and video lectures. An online library of supplemental material, including an extensive catalog of archetypes. A set of “House Cards” sent via email immediately after you sign up. ~ Video presentations by Caroline and CMED Faculty provide comprehensive,  step-by-step instruction throughout the Program. ~ Audio presentations are designed to enhance your comprehension. ~ Text material facilitates an in-depth study of program content at your own pace. Identify your own personal archetypal patterns, which form a chart of twelve. Of these, four are called the Survival Archetypes and are shared by everyone: the Child (of which there are several aspects: Magical, Divine, Nature, Wounded, Orphan, Invisible, Magical, Step-Child), Prostitute, Victim, and Saboteur. These combine to form the root challenges that give rise to the essence of self-esteem. You will choose your other eight archetypes through a process of identifying lifelong patterns of power, in both their positive and shadow aspects. Once you have determined your 12 personal archetypes, you will learn how to cast an Archetypal Wheel consisting of 12 houses related to the 12 houses of an astrological chart. Using an intuitive process, you will create your Chart of Origin, somewhat similar to a natal chart in astrology, but connected to your twelve archetypes rather than the zodiac per se. Finally, we will begin the fascinating and profoundly revealing process of interpreting your Chart of Origin, discovering the meaning for your life’s journey of each archetype in relation to the house into which it falls when you cast your chart. You will continue and expand this process of casting and interpreting your chart throughout the remaining seminars. My book Sacred Contracts describes the process of choosing your archetypes and casting your Chart of Origin that we engage at great depth in our first seminar. But after its publication I continued to explore this process, and my understanding has expanded to include two other wheels not mentioned in the book: the Kairos and Cosmic wheels. Taken together, these three concentrically arrayed wheels yield charts of great power and profundity, and during this seminar you will learn how to cast charts consisting of all three wheels. We will show you how to use these charts to receive guidance on a wide range of life issues, including, but not limited to, personal relationships, health, finances, career choices, and your spiritual path. The Kairos wheel, named for a Greek term meaning "the opportune moment," gathers the energies you feel around you at the time you are casting this chart. It's very much of the moment, and you will choose this entirely new set of 12 archetypes (not repeating any from your Chronos chart) based on your concerns, intuitive guidance, and powers or energies that you feel you may need in dealing with the situation for which you are seeking guidance. The Cosmic wheel represents your highest potential for each house. You will select these 12 archetypes from all the cards remaining in the deck after removing the 12 Chronos and 12 Kairos. Unlike those first two wheels, however, you will choose your Cosmic archetypes "blindly" from the deck with no conscious selection process. As a result, the level of intuitive guidance in this wheel is often surprising, and we sometimes refer to it as Heaven's clue. Finally, we will show you not only how to interpret this 3-wheel chart, but also how to read the three archetypes in each house to come up with a positive "action" step you can take to help resolve the issue at hand. Now that you’ve learned how to cast and read 3-wheel charts, we’ll show you how to apply them to one especially significant chart that you can use to reshape your destiny over the coming year. This particular chart, given the theme of Fate and Destiny, opens an extraordinary portal of influence over the whole of your life. Even though its focus is on reshaping the events of the next twelve months, the reality is that by redirecting those events you redirect the path of your entire future. There is a profound difference between the archetypal forces of Fate and Destiny: Fate is ruled by the choices of the ego, whereas your Destiny is determined by the higher influences of your soul. Having the opportunity to recognize the difference between ego and soul choices and then actually acting on those choices makes the power of a Sacred Contract more real and authentic to you than words alone can describe. As with most profound awakenings, words cannot bring you to a place of genuine empowerment – only action motivated by illuminated choices can. That is the inherent power you feel when you recognize and then act on a genuine Sacred Contract. You will also learn how to apply your new skills to reading charts for other people, whether friends and loved ones or professional clients. A significant part of the Sacred Contracts program includes encouraging individuals to pursue the profession of Archetypal Consultant. Enter your email below, and over the next three days, we’ll send you a sample lesson - one from each Sacred Contracts class. Each lesson will include written material and a video to give you a taste of what this exceptional program is like. Take SCO for Personal Development, or or Professional Certification. Choose the option that best meets your goals. If you aren’t sure, you can start with the Personal Development program and upgrade to Professional Certification when you’re ready. Lifetime access to the online course, audio and video lectures, and library. You’ll receive an email with a set of "HOUSE CARDS" immediately after registration. An invitation to sign up for one-on-one consultations with CMED Mentors anytime during the course at an additional hourly rate to facilitate your journey. Contact us for further details. You’ll enjoy the convenience and flexibility of taking the Program on your computer, tablet or mobile device. Be sure to read "About this Course" below before registering. Due to the nature of this program, all sales are final. 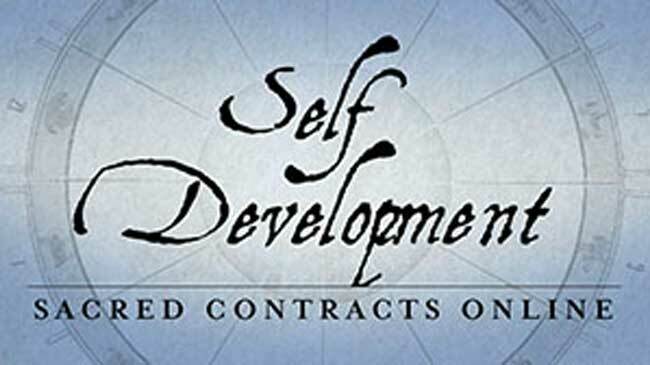 Access to The Sacred Contracts Online Facebook group. Two one-on-one 60-minute Evaluation Sessions with a CMED Mentor at the end of the course that includes specific coaching and personalized feedback. After passing your evaluations, you will be certified as a Certified Archetypal Consultant and can do this work professionally. Special Bonus: Archetypes Everywhere - 6 part Reflections series. Be sure to read "About this Course" and "About Certification" below before registering. Due to the nature of this program, all sales are final. The Sacred Contracts Online (SCO) course is not just a package of knowledge and methods that can be intellectually memorized and grasped. This course involves deep inner work as well as further development and refining of your intuitive abilities. That is not something you can force to happen overnight. We recommend that you take your time to sit with, process and practice this material. Please note that when this course was taught in live workshops, it took students one to two years to complete the entire process. Upon registering for this course, you will have access to all the material at once. Just because you can watch all the videos and read all the material in a matter of weeks, does not mean that you should. In fact, this is strongly discouraged. Some people find that additional one-on-one support greatly facilitates their learning. This support is available during the course with our CMED Mentors at an hourly rate. CMED Mentors are Certified Archetypal Consultants who have been selected by CMED specifically to assist you through this course material. Working with a CMED Mentor during the Sacred Contracts Online course can help you go deeper and further with this work but is in no way necessary. Contact us for further details. Purchasing this course and working through the course materials does not guarantee you certification. If you would like to receive the status of a Certified Archetypal Consultant you need to pass two evaluations. Each evaluation takes place in a 60-minute session. During one session you read a Sacred Contract and in the other a Journey of Transformation Wheel. If you do not pass your initial two evaluations you will need to pay an hourly rate for any re-evaluations. CMED’s Mentors offer plenty of feedback on where more study is needed. CMED retains the final say as to whom is certified, and can deny certification and/or re-evaluations to any student for any or no reason. Additional one-on-one support is available during the course with our CMED Mentors at an hourly rate. Working with a CMED Mentor during the Sacred Contracts Online course greatly aids your progress and gives you a head-start in preparing for the evaluation process. CMED Mentors are Certified Archetypal Consultants who have been selected by CMED specifically to assist you through this course material and with certification. The Mentors assist with your personal process as well as guide you through how to adapt this system to the work you do on behalf of others. Certification as an Archetypal Consultant does not entitle you to referrals or employment with CMED. CMED in no way agrees to promote or endorse you or your company. One exception to this is that upon certification, CMED will post content you provide (short biography, your photo, and contact information) on the Archetypal Consultant Directory on Myss.com. 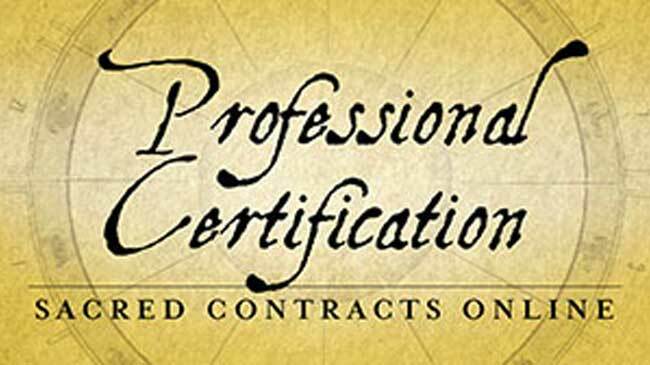 The Sacred Contracts Online Facebook group is exclusively available to participants of the Professional Certification Course. This is a private forum for students to discuss course material, receive guidance from CMED Mentors, and connect with other students. Posts of any outside links or services that are promotional in nature will be immediately removed from the group page. Customer service inquiries will also be removed. If you are in need of customer support you need to email us directly at support@myss.com. Professional Certification Course participants have two-years from the date of registration to complete the course and pass their certification. After that eligibility for certification expires.